What is kefir? It's a fermented dairy drink that contains living cultures and probiotic bacteria. Kefir's consistency is somewhere between that of milk and yogurt. It is produced by adding kefir grains to milk and letting the mixture ferment for at least several hours. 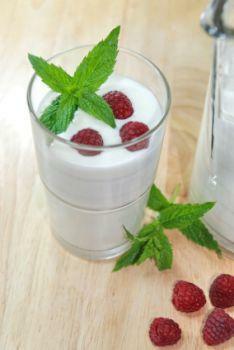 Kefir is also a valuable source of protein for vegetarians. To better understand what makes up kefir and why it has become so popular, it's helpful to look at how the beverage is made and the potential health claims associated with it. In answering the question what is kefir, it's a good first step to learn a little about both varieties of the beverage. Water kefir is a non-dairy beverage that combines slightly sweetened water with transparent kefir grains. The grains are small and look more like tiny crystals or granules of sea salt than milk kefir grains. Milk kefir, the most common variety of kefir, can be made from any dairy or non-dairy milk. It is fermented with grains that are white, cloudy, and larger than those used for water kefir. Both water and milk kefir contain probiotic bacteria. 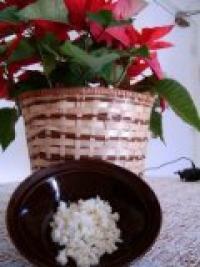 Kefir grains are not whole grains like oats, wheat, barley, or brown rice. Instead, they are a mixture of bacteria, yeast, protein, and sugar. The grains resemble cottage-cheese curds or small cauliflower florets. After being mixed with milk or a non-dairy beverage such as soy milk or coconut milk, the grains are left to ferment with the liquid for a minimum of several hours. The grains dissolve somewhat into the liquid and produce a beverage that is similar to thin yogurt or thick milk. Kefir has a naturally sour taste and is actually up to 1 percent alcohol. Since the taste of plain kefir can be off-putting to those who aren't used to it, sweeteners and other flavors are often added to bottled and commercially sold kefir. Kefir smoothies, mixes, and blends that include sugar or fruit are available in most health-food markets and many large grocery stores, and they're a good introduction to kefir for people who have never tasted it before. Some people who are lactose-intolerant or have trouble digesting lactose-rich products do not have the same difficulty with kefir because the mix of bacteria in the product feeds on its lactose and consumes much of it. Those who do enjoy kefir but have trouble digesting it at first may eventually increase their tolerance for the beverage by gradually increasing the amount they drink over time. Kefir's intense mix of probiotics, or beneficial bacteria that help the digestive system run smoothly, has gained the beverage a number of supporters. Kefir contains more probiotics than yogurt, fortified cottage cheese, miso, sauerkraut, or other fermented products, and some medical studies have suggested that consuming probiotics can help to prevent or even treat certain illnesses and maladies. Kefir is also an excellent natural source of calcium, potassium, and protein. Kefir and other dairy products can provide vitamins and proteins that meat products might provide in a conventional diet, making it a useful addition to the vegetarian diet. Some scientific studies have also suggested that kefir may have some influence in reducing the risk of cancer or impeding cancer cells from acting in the body. The studies are not all conclusive, but preliminary findings do indicate many potential health benefits of kefir. Kefir is sold commercially in markets. Like yogurt and other dairy products, it needs to be refrigerated promptly after purchase to prevent it from spoiling.You can also make kefir at home by using a starter package that contains kefir cultures and bacteria. Making your own kefir is not hard, but it can be time-consuming, and it's best for people who drink the beverage often and can use a lot of it quickly.